The prickly pear is delicious, if you can figure out how to eat it. The cactus fruit is covered by minute thorns, as hard to see as a strand of blonde human hair. Some Bolivians avoid the irritating thorns by holding the fruit with a fork and then peeling it with a knife. 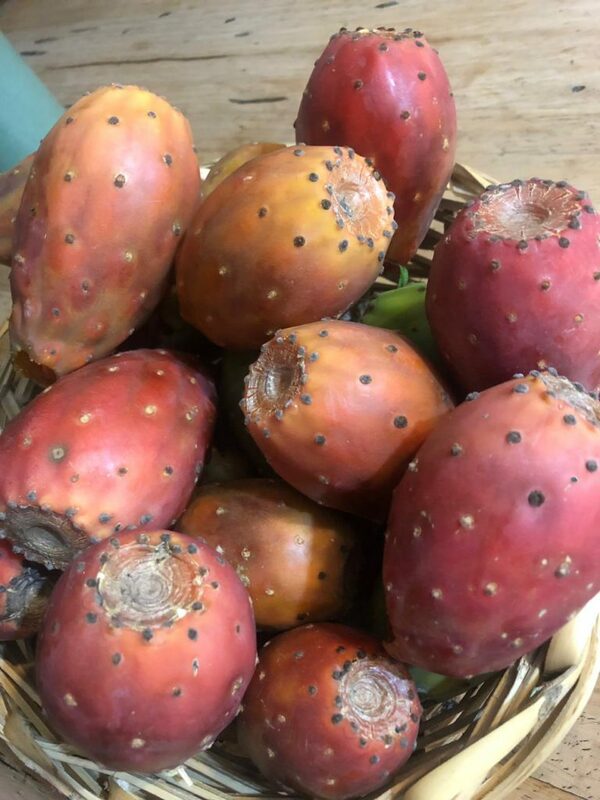 The little thorns on the fruit are so aggravating that they have their own name in the Quechua language: qhepu, as opposed to the larger thorns, called khishka, found on the pads of the cactus or on other spiny plants. On a recent Sunday afternoon Ana and I admired the fruit growing in the gardens of Villa, a village near Punata, and we wondered if anyone would sell us some. Ana thought they would not. Prickly pear is usually harvested in the morning, when the qhepus tend to be firmly attached to the fruit. If people harvest in the mid-day they can get covered in brittle qhepus. But two teenaged girls who were selling soft drinks in front of their house thought that their mom might sell us some fruit. It was late enough in the day to harvest prickly pear. Their mom, doña Norma, put on a thick leather glove and began twisting the prickly pears off of the cactus plant. Then she told her daughter to pick some branches of sunch’u, a weedy, flowering plant. Doña Norma took the prickly pears to a patch of thick grass where her daughter brushed off the qhepus with the sunch’u branches. A lot of information came to life that afternoon: how to harvest fruit with infuriating thorns, how to disarm the prickly pears with a handful of leaves, and the best time of day to do it. Local knowledge is like that: passed on not in the abstract, or in the classroom, but during everyday events such as working and eating.